2 Family-Friendly Healthy Meals…in Under 15 Minutes! 2 Gabrielle Reece: Best. Meal. Ever! The witching hour. Been there, Mom? Everyone's tired, tummies are grumbling, and kids are getting cranky. You've got to get dinner on the table--stat! Time to add a healthy and super-easy meal to your recipe repertoire. Hope Cohen, chef, author and cooking show host, and Robin Plotkin, a registered and licensed dietitian and culinary and nutrition communication consultant, offer tasty two options for the time-crunched mom. Cohen chose a recipe from her book "Fast, Fresh + Simple" and tweaked it slightly to make it more time efficient. The dish, which serves four, is a perfectly roasted fish paired with a cool, earthy spinach salad, jeweled by bits of orange segments. "It looks and tastes impressively complex," Cohen said, "but the whole thing takes minutes to throw together." Start by preheating your oven to 400 degrees Fahrenheit, Cohen said. Use a microplane grater to finely grate 1 teaspoon of orange zest. Combine 2 tablespoons of soy sauce and the orange zest in a small bowl. Brush four 6-ounce boneless, skinless salmon fillets with the soy mixture and drizzle 1 tablespoon of extra-virgin olive oil over them. Season the fillets well with coarse sea salt and freshly ground black pepper. Place them on an oiled sheet pan. Roast the salmon until the fish feels firm and starts to flake when gently prodded, about eight minutes. "Do not overcook this," Cohen said. "The fish should still be translucent in the center when it's done." While the fish is cooking, get started on the salad. Combine one 8-ounce bag of baby spinach, 1 cup canned (or in cups) skinless Mandarin oranges in water -- no sugar added -- in a large bowl. Add fine sea salt and freshly ground black pepper to taste, Cohen said, then toss the salad to combine. To make the vinaigrette, mix 1 tablespoon soy sauce, the juice of one lemon and 3 tablespoons extra-virgin olive oil in a small bowl with a whisk. Sample the taste of the mixture, adding additional salt and pepper if needed. Once the salmon fillets are done, carefully transfer them to a platter. This gives you the opportunity to blot the salmon with paper towels to absorb any excess oil if need be, Cohen said. Place a mound of salad in the center of each plate, and then top with a salmon fillet. 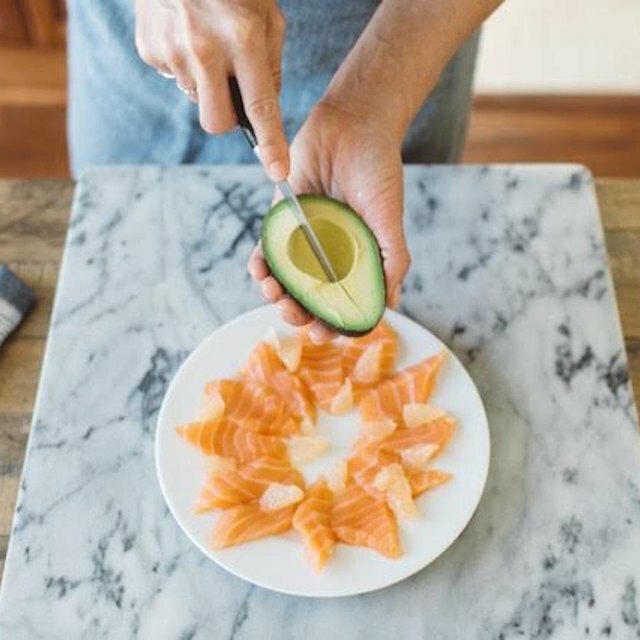 Use 2 tablespoons of roasted sliced almonds from a bag to garnish the salmon, along with a bunch of coarsely chopped chives if you wish. Last step? Raise your fork and dig in. OK, so technically, the cooking part of this meal takes longer than 15 minutes. But your actual prep time is under 15, so we just had to include it. This recipe comes from Plotkin, a busy mom herself, and is one of her latest quick-to-make dishes. In the morning, simply place the following into a slow cooker: 1/2 pound of boneless, skinless chicken breasts, thighs or a combination of the two; 1 cup frozen corn; a can of black beans, rinsed and drained; a jar of salsa (red or green); a can of green chilies; and 1 tablespoon cumin. Cook for eight hours on low, or four hours on high, Plotkin said. During the last 10 minutes of cooking, remove the lid and add two wedges of Laughing Cow Light Swiss cheese or 1/4 cup light sour cream. Stir to break up the cheese. To serve, garnish with two or three green onions -- both the white and green parts -- chopped, if desired. Serve with corn tortillas, brown rice or as is, Plotkin said. So simple it's almost silly.